As a young boy, the Toronto native taught himself to play guitar and piano. But hearing “Great Balls Of Fire” by legendary piano man Jerry Lee Lewis was, in Joe’s words, “a life-changing experience”. The piano instantly became his instrument of choice and he was soon fronting rock’n’roll bands and building a reputation as an entertainer who could fill a room and leave a crowd yelling for more. Joe’s flamboyant piano playing style owes as much to his love of acting as it does to Jerry Lee’s influence. Like a stage play, it’s designed to get the audience laughing, clapping and singing along. And it works very well. According to Joe; “poundin’, kickin’ and bustin’ up a piano gives a rock’n’roll show some drama”. No kidding! Great Balls Of Fire is no sleepy cocktail lounge act. 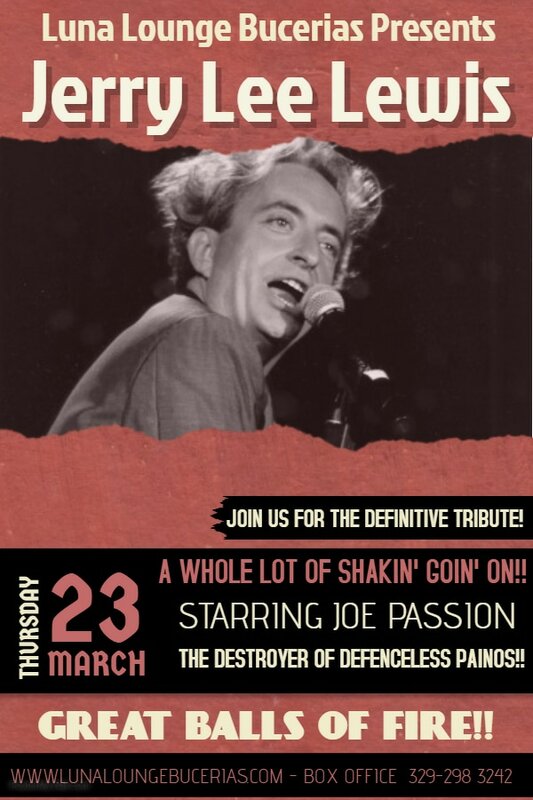 Whenever Joe Passion is on stage, like the song says; “there’s a whole lotta shakin’ goin’ on”.